With subtle styling and innovative technology, the Kohler Cachet seat fits most elongated toilets and features uniquely designed rubber bumpers that hold the seat firmly in place and prevent shifting. This Kohler Q3 Advantage seat features innovative technology that prevents slamming and simplifies both cleaning and installation. 1-year limited warranty The seat is ergonomically contoured for maximum user comfort and fits one- and two-piece toilets. Made of solid polypropylene, the Cachet is resistant to staining, fading, and chipping. It's backed by a 1-year limited warranty. The Cachet is also available in a round-front design. Q3 Advantage Design Kohler's Q3 Advantage toilet seats are specially engineered to ensure a proper fit, with subtle styling to complement a wide variety of toilet designs. Innovative features include technology that prevents lids from slamming and seats that remove easily for cleaning. 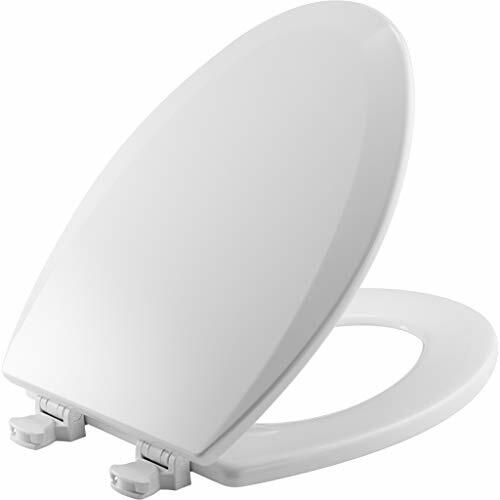 The Cachet Quiet-Close toilet seat with Quick-Release functionality is engineered to close with the slightest touch, reducing unwanted noise often associated with lid slamming. Additionally, it offers improved hygiene as you only need to make minimal contact with the seat or lid for it to begin to gently close. 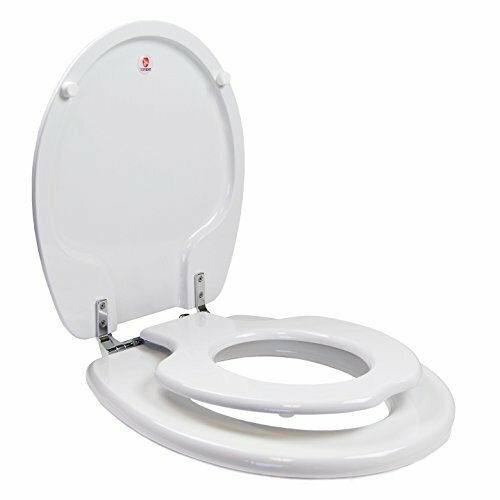 By removing the toilet seat, you can fully clean around the seat hinges, and in the case of two-piece toilets you can easily get around the area where the tank meets the bowl--places where dirt can accumulate and that are not readily accessible with a standard bolt toilet seat. Quick-Release technology allows the seat to be removed for easy cleaning (view larger). Bemis elongated closed front with Lid wood toilet seat. 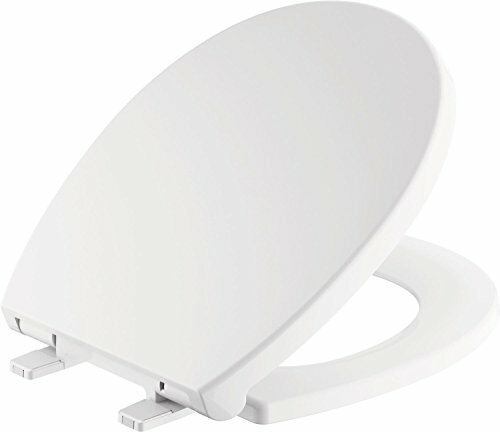 A round, closed front toilet seat with cover in white. This highly economical model is perfect for home usage. It is made of molded wood and features a multi coat enamel finish. 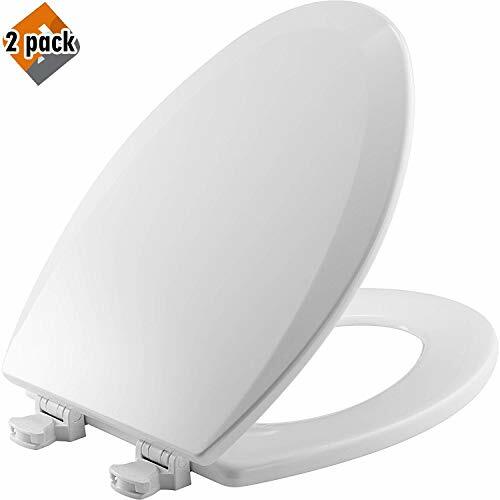 The toilet seat comes with bumpers and TopTite hinges. Easy, clean and change - twist hinges to remove seat for easy cleaning and replacement; bolts remain on toilet. Easy to clean - use a soft damp cloth with a mild detergent avoiding abrasive cleaners and brushes. 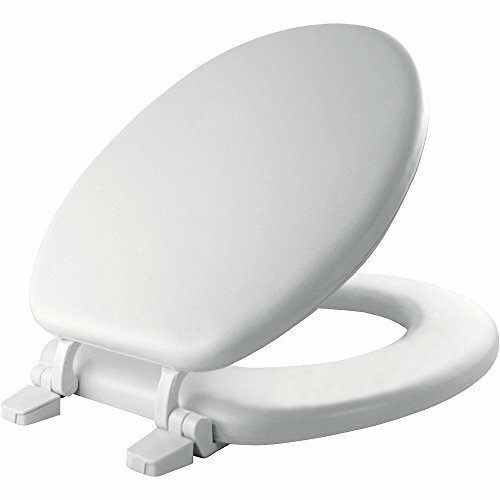 A round, closed front toilet seat with cover in white. This highly economical 800EC 000 is perfect for home usage. It is made of durable plastic and features a multi coat enamel finish. The toilet seat comes with bumpers and toptite hinges. 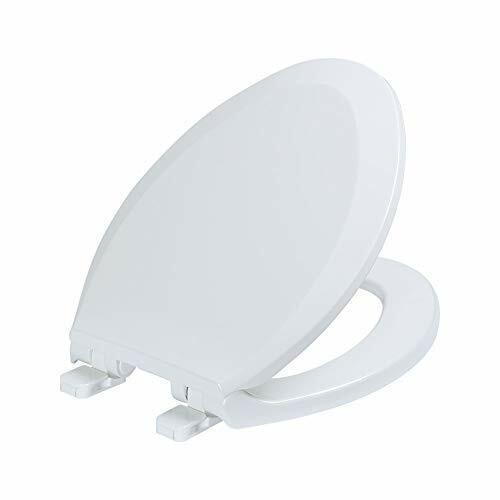 Easy to install, this Morgan round slow-close closed front toilet seat with no slip bumpers in white will provide years of reliable use. Delta toilet seats are thoughtfully designed and engineered for outstanding functionality and durability. The innovative no slip seat bumpers improve stability for extra comfort. Includes mounting hardware and installation instructions for diy peace of mind. "The Best Toilet Seat I've Ever Seen!" "Well worth the extra money!" Discover the #1 bathroom makeover idea that is quick, easy and affordable. Smart design and innovative, this comfortable toilet seat is softer and "warmer to touch" than an acrylic or wood toilet seats because polypropylene is a thermal insulator (like coating on a wire) and does not conduct heat. Extremely durable and long-lasting, the seat will last for years with proper care. Bonus!! Bath Royale seats come with an extra set of decorative caps (chrome and white included) to coordinate colors and finishes in your bathroom. Stainless steel caps with Brushed or Satin Nickle finish are available on Amazon (search "B01M72GXF8"). INSTALLATION NOTE: Some 1-piece toilets or bowls with flat sides (aka concealed trapway) require a top mount installation kit (sold separately), search "B0759WR3F9" on Amazon.com. LIMITED AVAILABILITY! Not available at Home Depot, Lowes or other discount retailers. 100% SATISFACTION GUARANTEED - If not completely satisfied, return within 30 days for a full refund. Our 2-year warranty is double most other toilet seats. Questions? Please call us 7 days a week at 704 589 1009, email "Contact Seller" or type your question in the "Customer Questions and Answers" area below. BUY 1 FOR EACH BATHROOM IN YOUR HOME! In the checkout area above, enter quantity, then click "Add to Cart". BEFORE YOU ORDER, measure your toilet bowl (see diagram at left) to determine if you need ROUND or ELONGATED seat. Bath Royale seats FIT ALL TOILET BRANDS including Kohler, American Standard, Toto, Crane, Eljer, Caroma, etc. 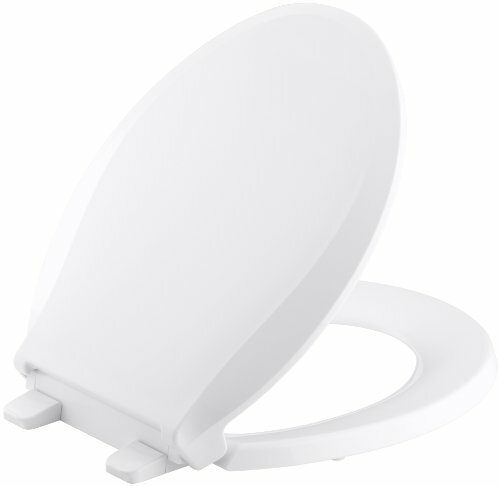 Also fits toilets with non-standard mounting hole spacings 4-7 inches. NOTE: NOT compatible with bidets that install between seat and bowl. QUIET-CLOSE prevents loud slamming, cracked toilets and pinched fingers. Tap forward and watch the seat and/or cover close quietly by themselves. Ideal for kids or adults with lower back pain because the user doesn't have to stoop or bend to lower the seat. May help teach boys (and men) to lift and lower the seat...because it's so easy! EASY TO CLEAN - Quick Release enables you to instantly remove the seat and thoroughly clean your toilet, including the nasty area between the mounting post where urine, grime and odor-causing germs collect. Helps keep your bathroom smelling fresh and clean. BETTER, MORE SANITARY and LONGER-LASTING than painted wood, molded wood or vinyl-covered foam padded soft seats. Made of top quality, 100% pure (not recycled) polypropylene (plastic) which is non-absorbent, chemical and stain-resistant. All Bath Royale seats are a solid color throughout, will not chip peel or fade. The beautiful HIGH-GLOSS finish will last for years with proper care and cleaning. 2-YEAR WARRANTY is double most other brands. STRONGER yet MORE COMFORTABLE. Softer and warmer to touch on sensitive body parts than painted wood, acrylic or other plastics because pure polypropylene is a thermal insulator (like coating on an electrical wire) and does not conduct heat. Tested to 400 pounds, 4 non-slip bumpers evenly distribute weight. The seat and cover will flex, but guaranteed not to crack, break or permanently deform. 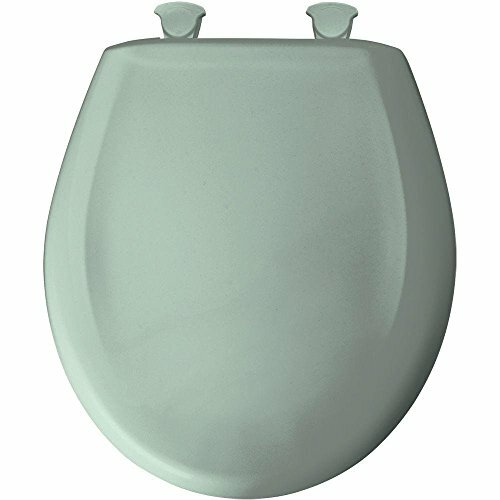 SoftClose action reduces injury and eliminates "Toilet Seat Slam"
Molcor enamel seat for regular bowls with traditional styling; Economical and dependable; Finished with multi-coat of baked enamel, color matched bumpers and top-tightening hinges. NOTE: Colors on a website or printed from a website can vary drastically from the actual color of the toilet seat due to monitor and printer settings. The colors on this page are for approximate visual use and should not be used to match colors exactly to a toilet bowl. Parents and children love this convenient, innovatively designed toilet seat created for enhancing the potty training experience of your child. 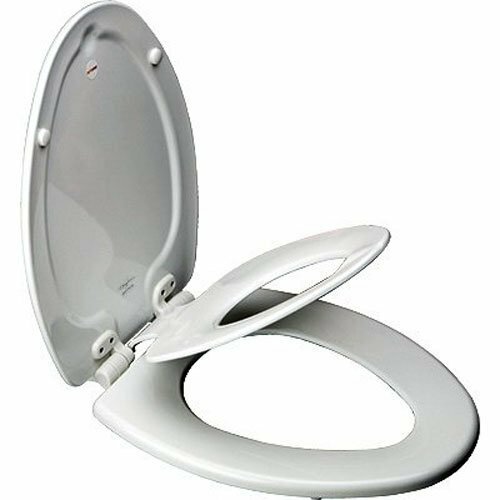 This seat can be used by both children and adults a magnetic closure gently secures the built-in potty seat into its compartment in the seat lid until it is flipped down for use. The hinges are sturdy chromed metal. The lid and the ring are both white. This particular model fits elongated bowls which measure 18.5 inches from hinge holes to end of the inside of bowl. Installation hardware included. Three-year warranty . Parents and children love this convenient, innovatively designed toilet seat created for enhancing the potty training experience of your child. This seat can be used by both children and adults! A magnetic closure gently secures the built-in potty seat into its compartment in the seat lid until it is flipped down for use. The hinges are sturdy chromed metal. The lid and the ring are both white. This particular model fits round bowls which measure 16.5 inches from hinge holes to end of the inside of bowl. Installation hardware included. THREE-YEAR WARRANTY! Warranty: EACH PRODUCT HAS A THREE-YEAR WARRANTY, CALCULATED FROM DATE OF ACCEPTANCE, AGAINST DEFECTS IN MANUFACTURE. TOPSEAT WILL PROVIDE AN IDENTICAL REPLACEMENT PRODUCT, OR IF UNAVAILABLE, A NEAR-IDENTICAL REPLACEMENT PRODUCT, SHIPPED AT TOPSEAT'S EXPENSE, IF BUYER RETURNS A PRODUCT TO TOPSEAT (AT BUYER'S SOLE EXPENSE) AND TOPSEAT, IN ITS SOLE DISCRETION, DETERMINES WHETHER OR NOT IT WAS DEFECTIVE AND QUALIFIES FOR REPLACEMENT. RETURN SHIPPING OF DAMAGED/DEFUNCT PRODUCTS IS AT CUSTOMER'S SOLE EXPENSE UNLESS SPECIAL PRIOR ARRANGEMENTS HAVE BEEN MADE. TOPSEAT IS NEITHER RESPONSIBLE FOR INSTALLATION OF PRODUCTS NOR FOR DAMAGE INFLICTED TO THE PRODUCT OR INJURY TO THE CUSTOMER DURING THE INSTALLATION PROCESS. EXCEPT AS PROVIDED IN THE PRECEDING PARAGRAPH, TOPSEAT DISCLAIMS ALL REPRESENTATIONS AND WARRANTIES OF ANY KIND (WHETHER ARISING BY IMPLICATION OR BY OPERATION OF LAW) WITH RESPECT TO THE PRODUCTS, INCLUDING, WITHOUT LIMITATION, ANY WARRANTIES OR REPRESENTATIONS AS TO MERCHANTABILITY, FITNESS FOR A PARTICULAR PURPOSE, OR ANY OTHER MATTER. THIS SECTION SURVIVES THE TERMINATION OR CANCELLATION OF THESE TERMS. Beautiful high-gloss finish and smart design is perfect for remodeling or updating any bathroom. Bonus: Bath Royale seats come with an extra set of decorative caps (chrome and white included) to coordinate finishes in your bathroom. Stainless steel caps with Brushed or Satin Nickle finish are available on Amazon (search item B01M72GXF8) and sold separately. 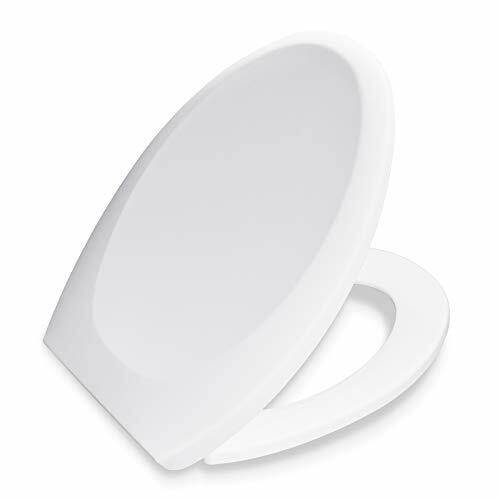 When potty seat is no longer needed, it can be permanently removed and stored for the next child or generation. LIMITED AVAILABILITY! Not available at Home Depot, Lowes or other big box retailers. BEFORE YOU ORDER, measure your toilet bowl (see diagram at left) to determine if you a need ROUND or ELONGATED seat. Available in ELONGATED ONLY. Fits ALL TOILET BRANDS including Kohler, American Standard, Toto, Crane, Eljer, Caroma, etc. 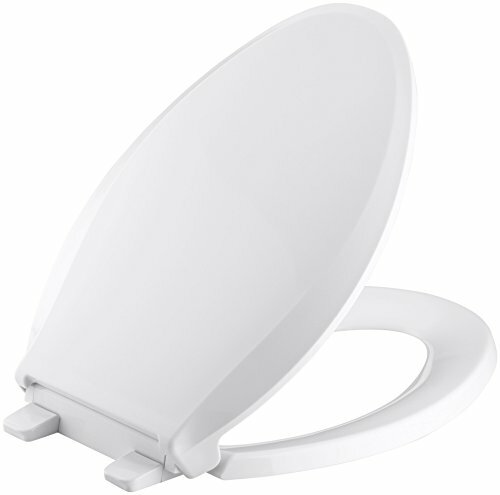 Also fits toilets with non-standard mounting hole spacings 4-7 inches. NOTE: NOT compatible with bidets that install between seat and bowl. ELIMINATES BATHROOM CLUTTER - 1 seat for the whole family. Built-in toddler seat attachment reduces accidents by eliminating the need to rush ahead of your child to install a potty ring or training seat. Builds confidence and promotes independence. CONVERTS TO A REGULAR ELONGATED SEAT when training is over (store the child's seat for future siblings). Matches any bath d cor or interior design. 2-YEAR WARRANTY is double most other brands. BETTER and LONGER-LASTING than painted wood. Made of the highest quality polypropylene (plastic), MORE SANITARY, non-absorbent, chemical and stain-resistant. Solid color throughout, this replacement seat will not chip peel or fade. BEAUTIFUL high-gloss finish will last for years with proper care and cleaning. STRONGER yet MORE COMFORTABLE. Tested to 400 pounds, the seat and cover will flex, but not crack, break or permanently deform. Softer than acrylic and stiff wood seats, it feels warmer to touch because polypropylene is a thermal insulator (like coating on a wire) which does not conduct heat. 4 non-slip bumpers evenly distribute weight. EASY TO CLEAN - Lift and clean enables you to instantly remove the seat for thorough cleaning. Helps keep your bathroom smelling fresh and clean. SOFT CLOSE x 3 (both seats & cover) prevents loud slamming, cracked toilets and pinched fingers. Ideal for kids, older adults or individuals with lower back pain because the user does not have to bend or stoop to lower the seat. This self-closing feature may help teach boys (and men) to raise and lower the seat because it's so easy. Featuring a ready to use built-in potty seat this innovative seat is ideal for your home. 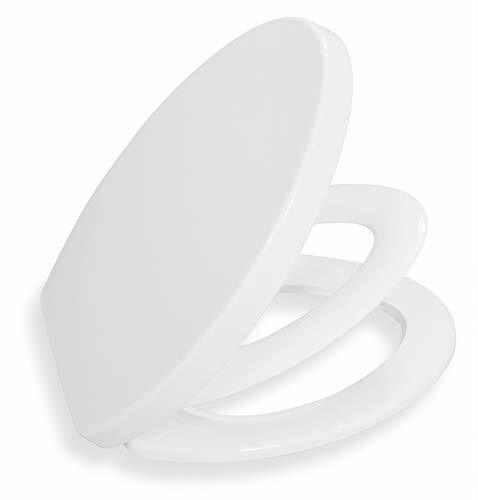 The potty seat automatically secures by a magnet into the recess in the molded wood cover, eliminating the need for the adult user to manually lift the child potty seat. 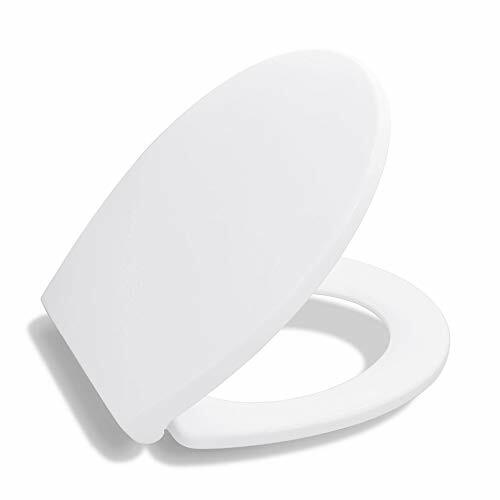 When no longer needed, the potty seat portion can be easily and permanently removed. NOTE: Colors on a website or printed from a website can vary drastically from the actual color of the toilet seat due to monitor and printer settings. The colors on this page are for approximate visual use and should not be used to match colors exactly to a toilet bowl. Note: Please measure the size as shown above to ensure that your toilet is suitable for this toilet cover. Antibacterial, The research shows that the toilet seat with the anti-bacterial material has a good property of chemical resistance and stain-resistant, more hygienic and non-absorbent, keep your family healthy by using anti-bacterial toilet seat. Soft close, The toilet seat close slowly and quietly without slamming and collisions, so it can prevent your family from waking up when you go to the toilet at night. What's more, the soft close function will be still in perfect condition after 100,000 cycles forced close, so it is available for hand push closing for faster close. Dual magnets, We designed the magnet on both sides of the cover to lets the child take the potty training seat off easier from the cover. The potty seat secures magnetically in cover if the child closes the cover after use. 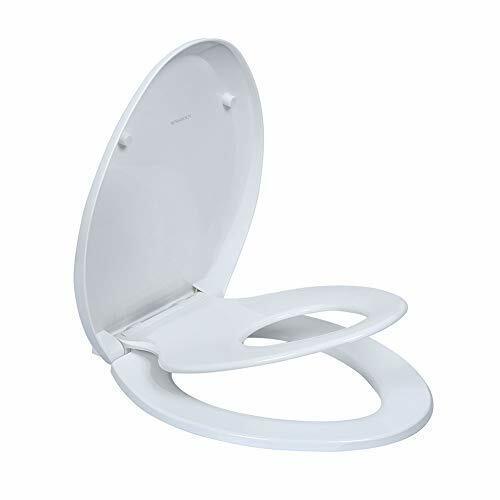 It is not necessary to lift up the potty seat again manually while the adult uses the product. Meet family needs, The child could earlier learn to use the toilet independently with the innovative and convenient 2-in-1 potty training toilet. 12 months free for replacement with a new one, you can get a new one for free if your seat has quality problems during the warranty period (delivery fee is not included). Please email us at lamea@lamea.cn if you have any questions. 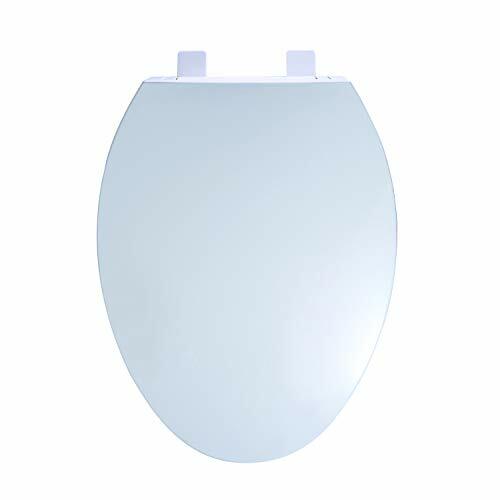 An easy to install bathroom safety solution, the Vive toilet seat riser with removable handles securely attaches to any elongated toilet seat providing 3.5" of added height. 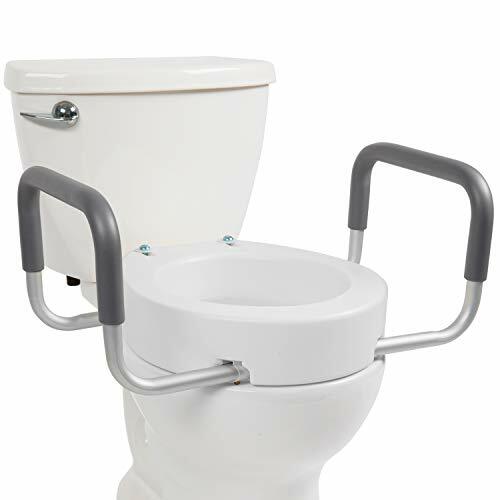 Great for those recovery for surgery or injury, the elderly and those with limited mobility the elevated toilet seat assists individuals when sitting or standing. Installing under any elongated toilet seat, the toilet seat riser securely attaches with the included screws and washers without the use of tools. An interior lip on the bottom of the riser eliminates slipping for a safe and secure seat. 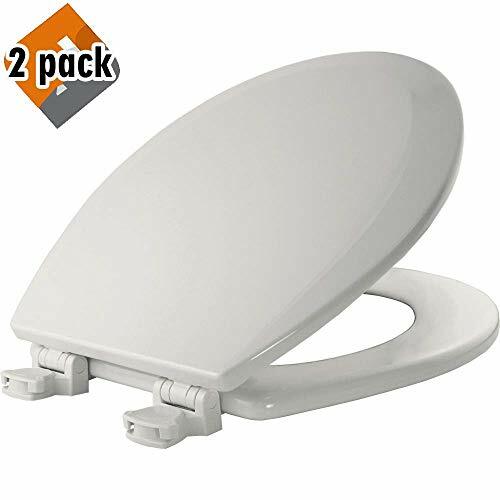 ADDS 3.5 OF HEIGHT TO EXISTING ELONGATED TOILET SEAT: Fitting under your existing toilet seat, the toilet seat riser adds 3.5 of height to the seat, making it easier to sit or stand without bending. A great bathroom safety solution for the elderly, those with limited mobility and those recovering from hip, knee or back surgery. TOOL-FREE INSTALLATION: Installing under any elongated toilet seat, the toilet seat riser securely attaches with the included screws and washers without the use of tools. An interior lip on the bottom of the riser, coupled with slip resistant strips, eliminates slipping for a safe and secure seat. SOFT COMFORT GRIP HANDLES: Removable handles are padded with comfortably soft foam hand grips for additional assistance when sitting or standing. The handles provide a nonslip surface for a safe and secure grip. Easily removable if desired, the width between the handles is a generous 22. 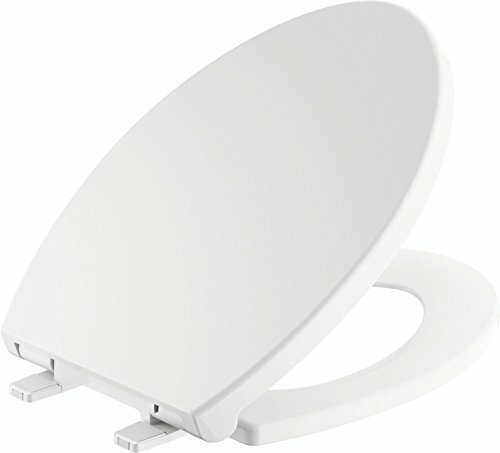 ADDS 3.5 OF HEIGHT TO EXISTING STANDARD TOILET SEAT: Fitting under your existing toilet seat, the toilet seat riser adds 3.5 of height to the seat, making it easier to sit or stand without bending. A great bathroom safety solution for the elderly, those with limited mobility and those recovering from hip, knee or back surgery. Measure Your Toilet Size Check to make sure your toilet is elongated (not round) for proper fit before ordering. 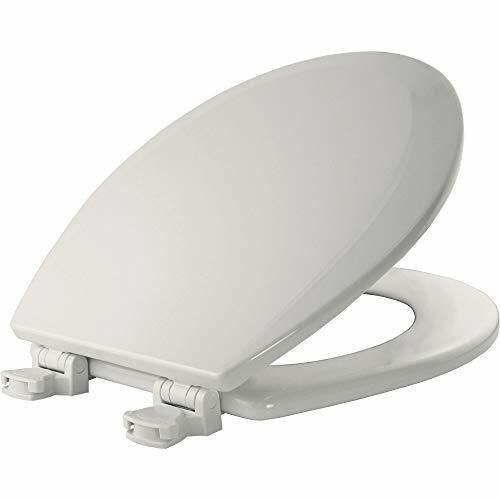 Elongated seat: 18.5" 14"; Mounting hole distance 5.5"
These Toilet Parts are All Manufactured by Top Brand Manufacturer. Best Toilet Seat Hinge, High Quality Guarantee. Perfect Toilet Replacement Parts for Your Old Damage One. For Installation with Excellent Toughness,Not Easy To Break. 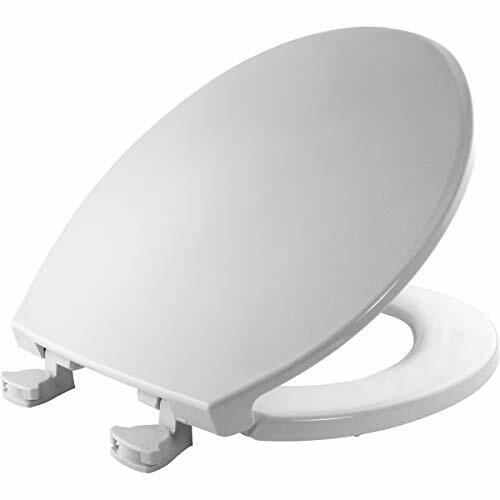 It Is Suitable for Universal Toilet seat ,Toilet lid . These Toilet Parts Can be Installed on Most TOTO, Kohler,American Standard Toilets. 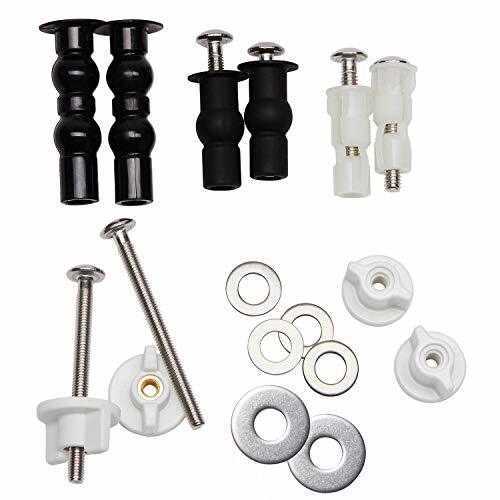 1.Top Tightening Toilet Seat Bolts and Screws with 5 Various Solution. Feel Free To Choose a Best Solution as Your Installation Need, Easy installation. 2.First Solution: [The First Choice] 2 PCS(1Set) Black Expanding Rubber(with Two Expandable Ball) with 7cm Length Bolt and Stainless Steel Gasket. 2 PCS(1Set)Black Expanding Rubber. [The Second Choice] 2 PCS(1Set) Black Expanding Rubber(with One Expandable Ball) with 5cm Length Bolt and Stainless Steel Gasket. 2 PCS(1Set)Black Expanding Rubber. 3.Second Solution: [The Third Choice] If Your Toilet Hole is Too Narrow and The Black Rubber Expansion Nut Can't Insert In. Please Try The White Plastic Screw Inside with 5cm Length Bolt Fix Blind Hole. 4.Third Solution: When The Expansion Nut Above Cannot be Inserted Into The Ceramic Hole, Bottom Lock Installation Method is Required. [The Fourth Choice] 7cm Length Bolt Screwed in Downlock Screw Nut with Brass Screw Inside as You Need. [The Fifth Choice] 5cm Length Bolt Screwed in Downlock Screw Nut Inside as You Need. 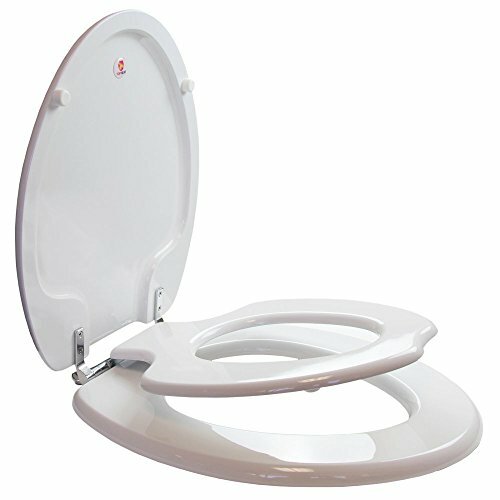 5.It Is Suitable for Universal Toilet seat. Can be Installed on Most TOTO, Kohler,American Standard Toilets and Others. 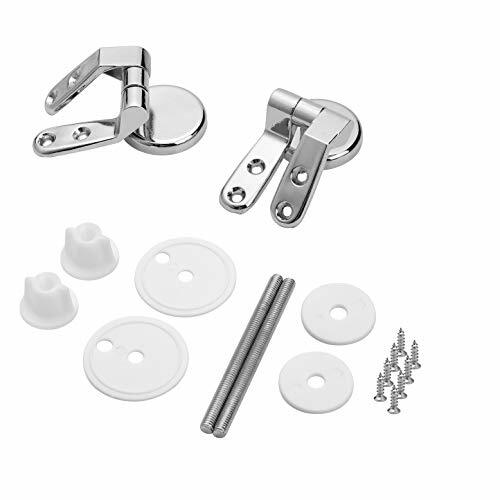 Material: Zinc Alloy Hinges + Rubber Kit + Stainless Steel Screws. Stylish design: Chrome effect plating is a perfect stylish upgrade for your commode. This Set Comes With All Fittings And Should Install With Ease, All You Will Need Is A Screwdriver. Suitable For Most Toilet Seats Wooden, Resin And Mdf.